In this post, we will show you how to restore the old theme and design, in the new Google Chrome version 69 UI. Also, how to restore the old New Tab Page in Google Chrome. 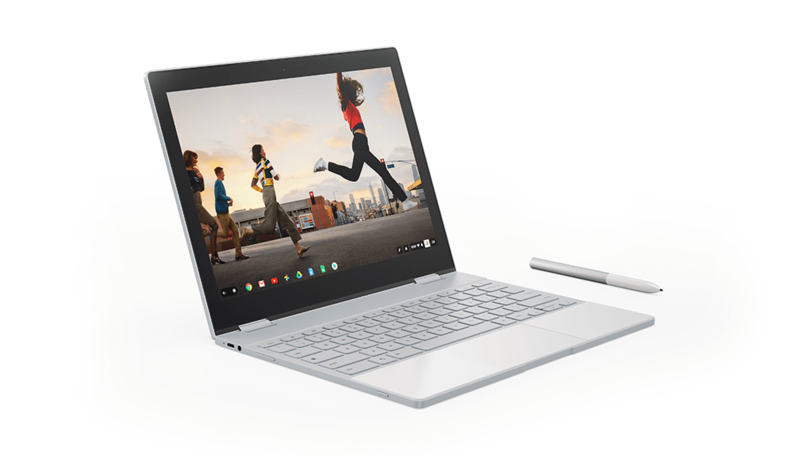 Google Chrome turned 10 this month, and Google decided to give a significant makeover to the ever popular Chrome browser. While I personally like the new Material Design Refresh UI in the Chrome 69 version as it feels fresh and less cluttered, not everyone will think the same. So, if you are someone who wants to have the old design of the Google Chrome back, here is an article with detailed steps to do the same. The latest UI change has also affected the Chrome’s popular homepage or new tab page. Instead of showing the most frequently used websites in a square box with a thumbnail, the homepage or new tab page shows only website favicon in the shortcut area. The new Chrome shortcut design is minimalistic but may not be appealing to everyone. For those who want to restore the old classic new tab page with website thumbnails in the shortcuts in Google Chrome, here is how to do it. 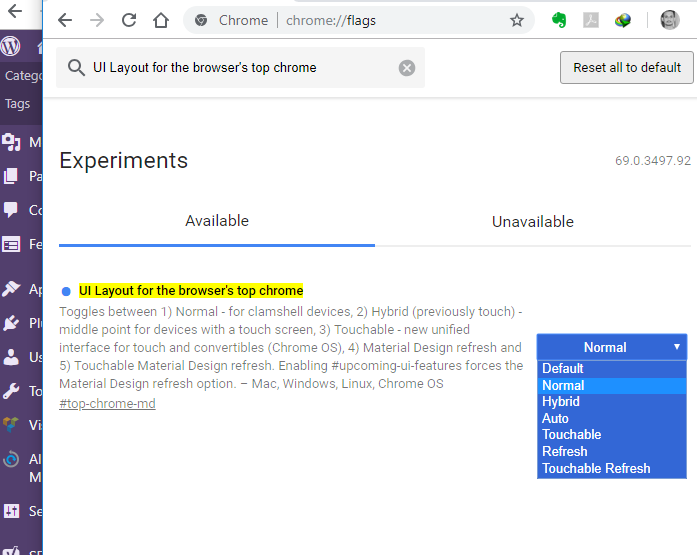 To restore old new tab page in Chrome, we need to disable the new material design refresh UI from the Chrome Settings. 1. Launch Google Chrome on your PC. open the Experiments section in Chrome. 3. Now you need to enable and disable some options in the Experiments section. You can use the Search Flag box to search for any of the options listed below. 4. 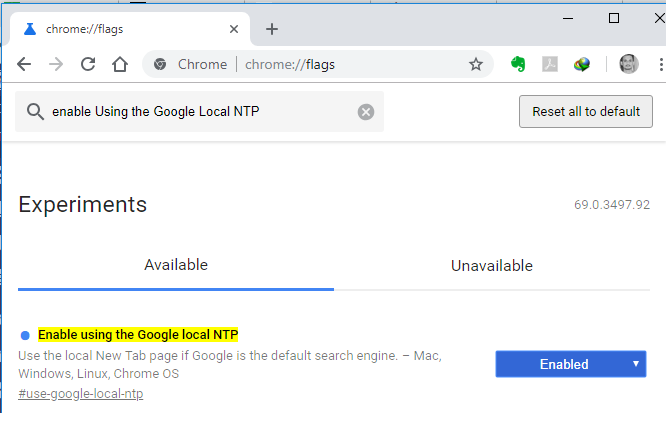 Search “Enable Using the Google Local NTP” and set it to Enable. 5. 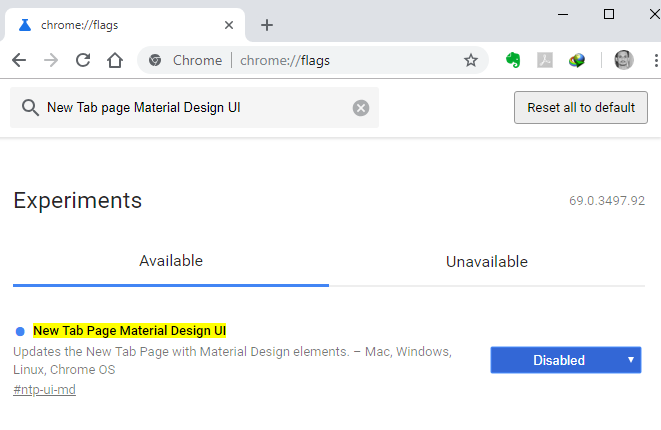 Search “New Tab page Material Design UI” and set it to Disabled. 6. Click “Relaunch Now” button and Chrome will close and relaunch automatically. Doing this should bring back the old New Tab page in Google Chrome. If you don’t see the old new tab page restored, follow these additional steps. Open Chrome and go to the Experiments section by typing chrome://flags in the search bar. Find the following options and set them as listed below. UI Layout for the browser’s top chrome – Normal. Once done, relaunch chrome, and you should have restored the old new tab page in Google Chrome. Google’s latest Chrome 69 and later version comes with a new UI that looks better than the previous one. But, if you want to get back the old Chrome UI and Theme, here is how to do it. 1. Launch Google Chrome and type Chrome://flags/ in the address bar. Hit enter, and it will open the Experiments section in Chrome. 3. The “UI Layout for the browser’s top chrome” is set to Default. Click the drop-down button and select Normal from the options. 4. A “Relaunch No” button will appear. Click on it and Chrome will close and relaunch automatically. So, that was about how to restore the old new tab page/homepage with website thumbnails and UI in Google Chrome version 69 and later. Apart from the cosmetic changes, Google Chrome Version 69 also brings practical changes such as not using CPU resources when the open tab is idle, using less memory per tab and more. If you can deal with the new cosmetic changes, the latest version of the Chrome is the best Google has offered in 10 years. What do you think about the new changes in Chrome? Do let us know your thoughts on the new design in the comments.